Taipei, Taiwan, December 18th, 2018 – GIGABYTE TECHNOLOGY Co. Ltd, a leading manufacturer of motherboards and graphics cards, announced its GIGABYTE PCIe M.2 SSD as an affordable, high-end storage solution in the mainstream market. 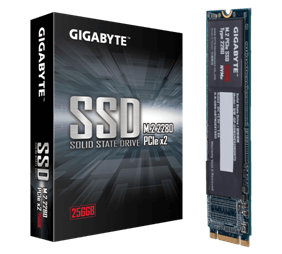 With overwhelmingly positive reception for the release of its 128GB and 256GB capacity sizes this past September, the GIGABYTE PCIe M.2 SSD offers users a significant upgrade from SATA to NVMe SSDs without the hefty costs associated with upgrading between the two interfaces. The release of its 512GB capacity size further solidifies the GIGABYTE PCIe M.2 as a viable mainstream option and allows users to experience NVMe performance at a remarkable value. Based off NVMe architecture, GIGABYTE PCIe M.2 SSDs enable the M.2 interface to utilize PCIe Gen3 x2 lanes in delivering storage performance with higher bandwidth and transfer speeds compared to the traditional SATA interface. The storage devices are incorporated onto GIGABYTE motherboards to undergo rigorous stress tests to validate their performance. Additionally, the devices support TRIM & S.M.A.R.T technologies so that users can enjoy added stability, quality, and durability. Paired with HMB (Host Memory Buffer) Technology and the extensively tested TLC Flash, the storage devices deliver superior performance at a much more affordable price range. With reduced SSD prices in recent years, many users have made the transition from SATA devices to M.2 devices. Despite the upgrade, storage performance from their M.2 SSDs is often bottlenecked by the utilization of SATA 6Gb/s lanes on their storage devices. The SATA 6Gb/s interface cannot match the read/write speeds of the SSDs, holding back their storage devices. NVMe based storage devices that utilize PCIe Gen3 lanes circumvent this issue but these devices usually come with PCIe Gen3 x4 lanes which makes them significantly more expensive. The GIGABYTE PCIe M.2 SSD offers the best in both performance and value with its utilization of PCI Gen3 x2 lanes for upgraded storage performance and user-friendly pricing. GIGABYTE states: “In the current state of the SSD market, SATA interface products have limitations in bandwidth which slows down overall performance. While users are looking for better performance, the price tags on NVMe based PCIe Gen3 x4 devices is holding them back from upgrading! GIGABYTE PCIe M.2 SSD is based on NVMe architecture and uses PCIe Gen3 x2 lanes to maximize NAND Flash performance for the fastest data access speed. HMB technology enables system memory sharing which reduces the need for additional cache memory and doesn’t compromise SSD performance, making the NVMe based M.2 SSD easy to use.